Driving in Russia is crazy. Accidents, bumps, and scratches are extremely common; people don’t follow the lanes, signals or lights; drivers are angry; pedestrians are hurried and don’t pay attention. Traffic police are out to catch you and try to get you to bribe them with a LOT of money. In short, it’s terrifying. 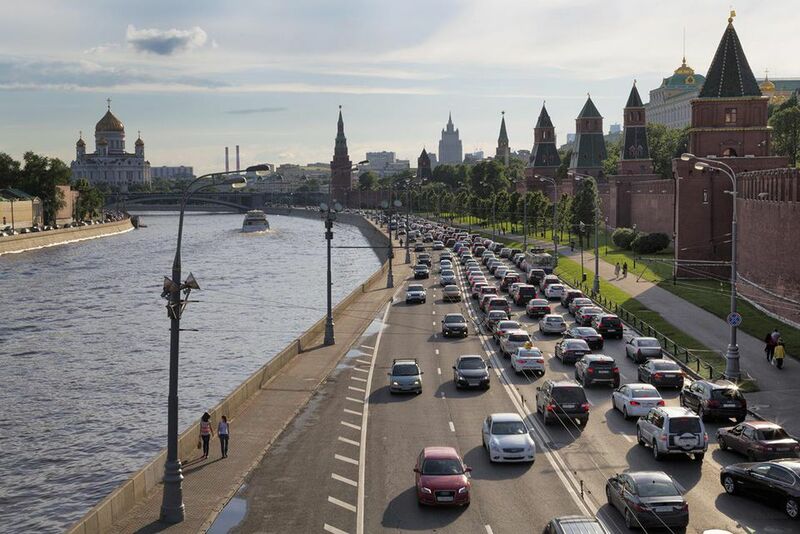 Unless you’ve driven in Mexico City, stay away at least from the big cities in Russia. In most big cities, and especially in Moscow and St. Petersburg, public transport like the Metro system is very well-developed: fast, easy and cheap. If you don’t want to (or can’t) take public transit for whatever reason, taxis are relatively affordable as well, although it’s always cheapest (but not always safest) to simply flag someone down and offer them a price. Regardless, in big cities, you will usually have many alternatives to driving. It's not recommended to rent a car unless you are going somewhere rural, or visiting multiple cities on a short trip, such as touring the Golden Ring. Select an agency which is known worldwide, or at least in Europe. Although the rates will likely be a bit higher than renting from a local agency, the peace of mind it will bring you is worth much more. This is because rental rules can be murky in Russian agencies, and it’s fairly easy to get tripped up by missing something in the Russian contract; not to mention, most people won’t speak English there. It’s also good for you if you get involved in any sort of traffic accident or mishap to be connected to an international agency instead of a local one, as you will have more power (as a consumer) with an agency that has its global reputation at stake. Renting from a European or international agency will also make it easy for you to find your car if you are planning to rent immediately upon arrival at the airport. The big agencies usually have stands right inside Russian airports; just look for the appropriate sign, which should be easy enough to find. Agencies should take cash or credit card payments. Before attempting to drive anywhere except Moscow and St. Petersburg in Russia, its highly recommended learning and understanding the Cyrillic alphabet, as well as learning at least a few key Russian phrases. Once you get out of the big cities, you are highly unlikely to see any signs in English, and of course the further you get away from the big cities the fewer people will speak English as well. What Should You Buy on Your Trip to Russia?